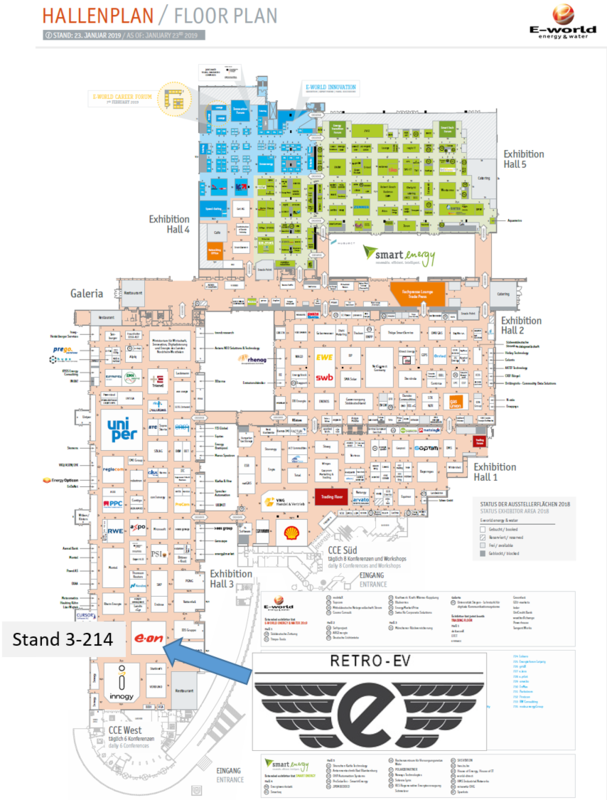 Team Retro-EV is very pleased to invite you to visit us again live and in-person, this time for our first exhibition in Germany, at the international energy industry event of the year: E-World 2019 Energy & Water Essen, Germany February 5 – 7 This event encompasses all aspects of the energy and clean water distribution networks of the world. E-world is the meeting point for the European energy industry. Exhibitors from all over the world present sustainable technologies and intelligent services for the energy future. E-world 2019 combines the focus topics Smart City and Climate Solutions – to encourage sustainable transformation and promote intelligent infrastructures. In 2018, Retro-EV established a partnership with E.ON Drive to promote sustainable energy utilization across the e-Mobility sector. The synergy between E.ON Drive’s focus on making the future a better place for everyone, as well as Retro-EV’s dedication to the upcycling of potentially millions of existing fossil-fueled vehicles, by EV Transformation using our patent-pending Modular EV Arcitecture, make for a perfect fit. E.ON Drive uses the phrase “Tomorrow is ·on” to represent their transformation at E.ON, from an energy supplier to the leading provider of sustainable customer solutions. This is taking place now and not tomorrow; the future belongs to E.ON and Retro-EV resonates to the same sustainability frequency! Combining the best elements of the authentic classics with the best elements of contemporary EVs, through multi-disciplinary engineering and innovation!